Voted by Readers of USA Today-10Best as the 2nd best State Park in the United States, the "Porkies" offers superb scenic views, top-notch hiking and backpacking, mountain biking, and other pursuits in a 60,000 acre wilderness preserve. 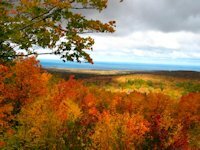 To get to Porcupine Mountains State Park from the west, we recommend traveling via US 2 to Wakefield, Michigan, then take Michigan 28 and Michigan 519 to the Presque Isle Unit of the porkies. For the casual visitor, There's camping, a picnic area and a nice day hiking trail network around its fantastic waterfalls. And of course, for the serious backpacker, Presque Isle connects with the extensive backpacking trails that run through the porkies. 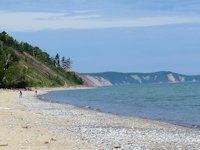 If you are coming from the east, we recommend going through Ontonagon via Highway 64 to Silver City. 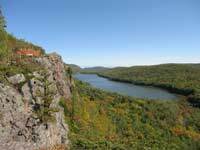 Visitor attractions at the east end are the Wilderness Visitor Center, picnic areas along the lake, Union Bay campground, and Lake of the Clouds scenic lookout. If you are coming from the west, take Michigan 519 out of wakefield. The Presque Isle Camping unit is at this end of the park plus their most magnificient waterfalls. After leaving the Preque Isle unit, you take the south boundary road which runs between the west and east ends. Several trailheads for short or multi-day hikes are along this road. But the most "don't miss" attraction is the road and a trail to Summit Peak (pictured below). The Porkies cover 60,000 acres and is Michigan's largest state park. Within the park is a block of old-growth forest comprising almost 35,000 acres and considered by some to be the biggest and best stand of virgin Northern Hardwoods and Hemlock in North America. In the picture to the right, Jo and Hans stand by a huge old-growth Yellow Birch tree that is representative of what is in abundance in the Porkies. The half mile hike to Summit Peak is reached from the trail head off the South Boundary Road. At 1958 feet elevation, it offers quite a panoramic view of the area. A boardwalk covers the last few hundred yards of the Summit Peak trail. Far Right. Jo and Hans take a rest at the bottom of the Observation Tower. There is also an observation deck before you get to the tower which offers some great views for those not willing to climb the steps to the top of the tower. Fall Color Pictures from the top of Summit Peak. Our camping site at Union Bay Campground (near right). 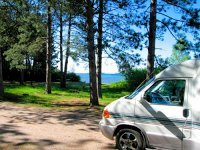 The campground has 100 camping sites, with showers, electric and RV dump station. Several prime sites are along the waterfront. See Campground Map (far right). Here's a full map you can print out showing the campsites, back-country rustic cabins, hiking trails, waterfalls, and other points of interest within Porcupine Mountains Wilderness State Park. 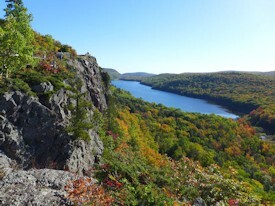 Here's a link to a publication with more info on visiting the Porcupine Mountains - Porcupine Mountains Visitor. Going east towards Marquette, Munising and Pictured Rocks . 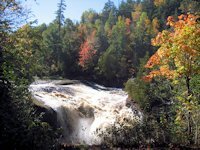 . . More waterfalls, hiking pages, and scenic attractions from Munising through Tahquemenon Falls to Sault Ste. Marie. Going west towards Black River Scenic Area . . . waterfalls, hiking, camping, rock picking. 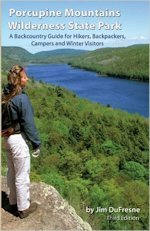 The third edition of the most comprehensive guide to the hiking trails and backcountry camping of Porcupine Mountains State Park. Great for planning your trip or tuck the book in your backpack during your hike.